After a beautiful sun-soaked day in Snohomish farm country, we walked a few feet from the party to make a shot at night. At each wedding, in fact, I try and get some kind of shot like this where it forces me to use my creative muscles and if executed properly, might serve to be the final full-bleed spread in their wedding album. 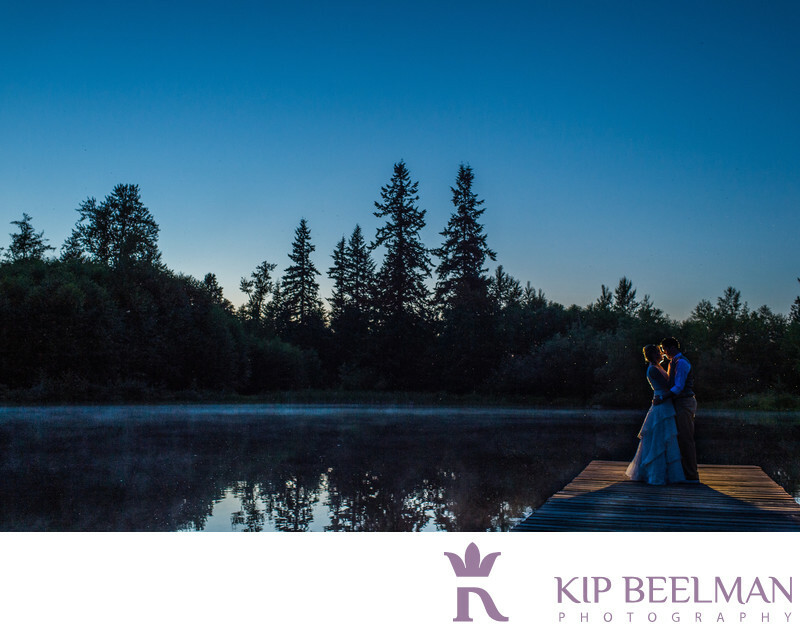 A Country Location has a lovely pond with this nice dock that seems like the perfect environment to made a lovely wedding photograph. My assistant went to the end with a small handheld flash and knelt down. The couple, having been going hard all day, took this opportunity to take each other in among the peace, quiet and crickets of the pond. I knew I’d be able to pull in some of the remaining light from the night sky, but I couldn’t even see the fog that had developed on the surface of the pond. The should would have been great without the fog, but that element makes it especially unique. This peaceful country paradise provides grounds for a lovely nature walk, a barn, a windmill, incredible gardens, a fountain and A Country Location provides a fantasy location for weddings and wedding photography.